Justin Whittle was born in Derby on 18 March 1971. Arguably one of the more iconic footballers of recent times for his part in the so-called ‘Great escape’ of season 1998-9 when Hull City came perilously close to being relegated from the football league Justin joined the club from Stoke City during the 1998-9 season having initially been on the books of Glasgow Celtic having been spotted playing football for the British Army. A tough uncompromising centre half he quickly established himself as a ‘fans favourite’ throughout a career that lasted until the 2003-4 season. During that time he made played 219 games scoring 3 goals.He later went on to play for Grimsby Town. Jason Harris was born on 24th November 1976 in Sutton. The tall and fast paced striker joined Hull City for £30,000 from Preston North End at the start of the 1999-2000 season. He played for the club across 2 seasons making a total of 45 appearances scoring just 4 goals before being released. Colin Alcide was born on 14th April 1972 in Huddersfield. He joined Hull City in a £50,000 transfer from Lincoln City in February 1999. Known as the “Lion of St.Lucia” the striker made a total of 35 appearances for the club across the 1998-9 and 1999-2000 seasons scoring a total of 6 goals including a memorable one to equalise against Liverpool in a League Cup tie in 1999. He later transferred to York City for £90,000 in the autumn of 1999. Steve Morgan was born on 19 September 1968 in Oldham. A former premiership footballer with Coventry City he joined the club at the start of the 1999-2000 season when the club was in the bottom tier of English football. He went on to make a total of 25 appearances that season scoring 3 goals before being released at the end of the season. Rodney Rowe was born in Huddersfield on 30 July 1975 and joined Hull City on a free transfer in 2001.He was a fast paced striker who made a total of 37 appearances scoring 8 goals. After leaving Hull City he went on to play in non-league football with Emley before embarking on a coaching career. Ian Goodison was born in Montego Bay, Jamaica on 21 November 1972 and along with his friend Theodore Whitmore was signed by Hull City at the start of the 2000-1 season by the then manager Brian Little. 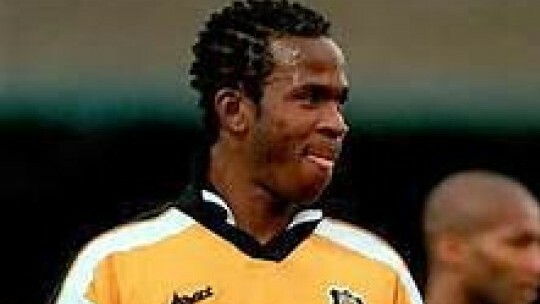 Goodison went on to play for Hull City 77 times scoring 1 goal before returning to Jamaica in 2002. He was so successful at Hull City that he was named the club’s ‘Player of the Season’ in 2000-1. He later returned to play in English football with Tranmere Rovers. He played representative football for Jamaica 128 times scoring 10 goals and appeared in the 1998 World Cup Finals in France. Theodore Whitmore was born in Montego Bay, Jamaica on 5 August 1972 and joined Hull City after a one week trial at the start of the 2000-1 season along with his compatriot Ian Goodison.as a junior player. A highly skilful midfield player Whitmore rapidly became a crowd favourite. He played a total of 77 times for the club scoring 9 goals before his Hull career was cut short by a road accident in his native Jamaica. He later went on to play for Livingston in Scotland and Tranmere Rovers. He made a total of 116 appearances for Jamaica scoring 24 goals including the 2 goals that Jamaica scored in the World Cup finals in France in 1998. After finishing his playing career he went on to manage the Jamaica national side. Carl Regan was born in Liverpool on 14 January 1980 and after initially making 14 appearances for Hull City as right back during the 2002-3 season signed permanently for the club in 2002 and went on to make a further 24 appearances. Clayton Donaldson was born in Bradford on 7 February 1984 and started his career with Hull City in their youth system scoring on his debut in the Football League Trophy. His opportunities were limited and he only played 5 games for the club before leaving to subsequently have a prolific career initially with York City and then with Hibernian in Scotland, Crewe Alexandra, Brentford and Birmingham City. He made his debut for Jamaica, his parents’ country in 2015 and scored his first goal in the match against Haiti in the same year. Carl Junior Lewis was born on 9 October 1973 in Wembley. After a long and varied career he joined Hull City in the 2004-5 season having formally worked with coach Peter Taylor at four different former clubs. A midfield player he went on to make 39 appearances for the club scoring 1 goal. Jason Price was born on 12 April 1977 in Aberdare, Wales. A right-sided midfield player who quickly became a fan’s favourite during his time at the club played for Hull City between 2003 and 2006 during which time the club gained promotion to The Championship. He will be fondly remembered for scoring a hat-trick against Doncaster Rovers in a 3-1 win during the club’s 2003-4 promotion winning season. He made a total of 75 appearances scoring 13 goals. Delroy Facey was born on 22 April 1980 in Huddersfield. A fast paced forward he joined Hull City in June 2004 and went on to make 16 appearances scoring 6 goals before joining Huddersfield Town on loan. He later went on to represent Grenada at international level playing 15 times and scoring 2 goals. After finishing his playing career he went on to become a players’ agent but was jailed for two and a half years in April 2015 for match-fixing. Marc Joseph was born in Leicester on 10 November 1976. 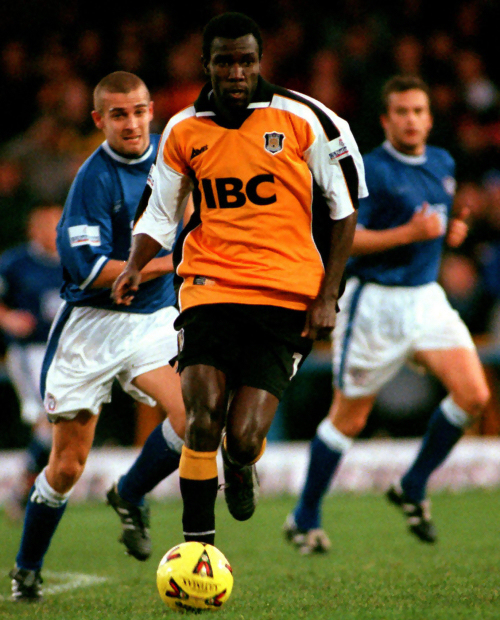 A central defender, Joseph made a total of 89 appearances for Hull City scoring one goal in a career that spanned 2002-6 which saw the club enjoy back to back promotions from Division 3 up to Division 1 (now the Championship). He left the club in 2006-7 to join Blackpool. Joseph played representative games for Antigua and Barbuda between 2008 and 2012 making 12 appearances and scoring 1 goal.